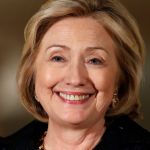 Hillary Clinton is an American politician, born in Chicago in 1947. The final U.S. presidential debate is reported to have been seen by 76.1 million people, not including those who streamed the debate online. This figure is less than that of the first debate, but still the third highest in debate-watching history. Their September meeting attracted an audience of 84 million, but still the largest in the history of US presidential debates. The second debate was seen by 66.5 million people in the US, according to Nielsen. Top researchers have noted that this is achievable if we make the commitment, marshal the resources, and provide the needed leadership…[Clinton] knows that reaching the goal will involve investments across the drug development cycle, from basic research to applied and translational research to public-private partnerships for clinical research. Trump demands an apology from Clinton over her remarks that he is being used for ISIS recruitment. I would hope that, given the extraordinary capacities that the tech community has and the legitimate needs and questions from law enforcement, that there could be a Manhattan-like project — something that would bring the government and the tech communities together to see they’re not adversaries, they’ve got to be partners…Maybe the backdoor is the wrong door, and I understand what Apple and others are saying about that. I know that law enforcement needs the tools to keep us safe. In an interview on Meet the Press, Trump calls Clinton a liar. It’s just another Hillary lie. She lies like crazy about everything — whether it’s trips where she was being gunned down in a helicopter, or an airplane. She’s a liar and everybody knows that. During the Democratic presidential debate Clinton says Trump is hurting the U.S. fight against terrorism with anti-Muslim rhetoric. He is becoming ISIS’ best recruiter.They are going to people, showing videos of Donald Trump insulting Islam and Muslims in order to recruit more radical jihadists…The first line of defense against radicalization is in the Muslim American community — people who we should be welcoming and working with…I worry greatly that the rhetoric coming from the Republicans, particularly Donald Trump, is sending a message to Muslims here in the United States and literally around the world that there is a clash of civilizations, that there is some kind of Western plot or war against Islam, which then, I believe, fans the flames of radicalization…If you’re going to put together a coalition in the region to take on the threat of ISIS, you don’t want to alienate the very countries and people you need to be part of the coalition. In an interview with Woodruff on PBS NewsHour, Clinton says she opposes the Trans Pacific Partnership trade deal, a deal she backed while she was Secretary of State. She says it fails to create good jobs, raise wages and advance national security. What I know about it, as of today I’m not in favor of what I’ve learned about it…I still believe in the goal of a strong and fair trade agreement in the Pacific as part of a broader strategy both at home and abroad, just as I did when I was Secretary of State. I appreciate the hard work that President Obama and his team put into this process and recognize the strides they made. But the bar here is very high and, based on what I have seen, I don’t believe this agreement has met it. Clinton unveils gun control measures she would enact as president, including calls for universal background checks and a crackdown on the sale of guns on the Internet. She invites the mother of a boy who was killed in the Sandy Hook Elementary School shooting to join her on stage. So many of the parents of these precious children who were murdered have taken the unimaginable grief that they have been burying and have tried to be the voices that we need to hear, and I want you to introduce yourself and maybe talk about what you and other parents are trying to do to get the changes that are necessary. Gun violence prevention was no where on my radar before losing my son and I wish it had been and I wish I had done something long before something that I thought could never hit my community hit me. In a skit on SNL, Clinton (McKinnon) confides her concerns about the 2016 presidential race to her bartender, Val (Clinton), and sings Lean On Me. Clinton: I’m just so darned bummed, all anyone wants to talk about is Donald Trump. Val: Donald Trump? Isn’t he the one that says ‘you’re all losers’? During a preview of an interview with Dunham, Clinton urges young women make pragmatic political choices even when they can’t get excited about candidates. Whenever I’m talking to young women about politics, I always say, look, you don’t have to run for office, you don’t have to be actively involved, but you do have to exercise your brain in deciding what you believe and who you will support. And sometimes, it is choices between people that none of whom excite you, but study it enough to figure out, OK, if I vote for this person over that person, I’m more likely to see progress on something I care about. Clinton also urges young women to not get turned off by negativity in today’s politics. You kind of can cut through that and say, look, I not only have a right, I have an obligation to make a choice. That’s part of the service I pay for living in our country. So I’m going to vote for X or Y. Not because I think that person is perfect, but it’s going to be better than the alternative. If you can’t get excited, be pragmatic and do it anyway. Documents obtained by Judical Watch say that despite denials, Clinton approved paperwork that changed her top aide Huma Abedin’s job status to “special government employee” — a classification that allowed Abedin to work for an outside consulting firm and the Clinton Foundation at the same time she was advising Clinton at State. The Clinton Campaign says the document wasn’t the actual approval of the SGE status but only approved the title change that came with Abedin’s transition. Abedin’s lawyers have maintained that she did nothing wrong, noting that government workers have moved to SGE status before. Clinton, in an interview with MSNBC on Sept. 4, said she “was not directly involved” with Abedin’s job arrangement. Reporter: Do you think [Donald Trump] had a point in raising the question of whether it was appropriate for her to be taking a State Department salary and also be paid by an outside company closely associated with your husband, by you? Clinton: Well, I was not directly involved in that, but everything that she did was approved under the rules as they existed by the State Department. I don’t think we need to have a pipeline bringing very dirty oil, exploiting the tar sands in western Canada, across our border…I don’t think it’s in the best interest of what we need to do to combat climate change…I thought this would be decided by now, and therefore I could tell you whether I agree or disagree. But it hasn’t been decided and I feel now I’ve got a responsibility to you and to voters who ask me about this. Clinton proposes a $250 monthly cap on out-of-pocket prescription drug costs as well as a plan to encourage the development and use of generic drugs and to end pharmaceutical companies’ ability to write off consumer-directed advertising as a business expense. The monthly cap would limit what insurance companies could ask patients to pay for drugs that treat chronic or serious medical conditions. She also wants Medicare to be able to negotiate with pharmaceutical companies over drug prices and require more generous rebates. Consumers would also be allowed to purchase drugs from other countries, where medicine is often less expensive, so long as sufficient safety standards are in place. We need to protect hard-working Americans here at home from excessive costs. Too often these drugs cost a fortune…That is bad actors making a fortune off people’s misfortune. I cannot imagine anyone being more of an outsider than the first woman president. So you know, I’m not running for Bill’s third term, I’m not running for President Obama’s third term, but it would be foolish of me not to say, ‘You know, that worked better than what the Republicans offer. Clinton chats with Fallon, playing Trump, in a skit on The Tonight Show. Clinton: What is your stance on women’s issues. Fallon/Trump: I know a lot of women and they have issues. Yeah, well, at least he doesn’t have one strand that he twirls over his head like a soft-serve at Dairy Queen. Clinton dances with Ellen on The Ellen DeGeneres Show. Dancer Boss teaches them the Silento’s Watch Me (Whip/Nae Nae) dance moves. Senior Clinton campaign officials claim that she has already secured about 130 superdelegates publicly backing her, but a person familiar with recent conversations in Minneapolis says that officials are telling supporters and the undecided in the last few days that private commitments increase that number to more than 440—about 20 percent of the number of delegates she would need to secure the nomination. It is estimated that 4,491 delegates will attend the convention, meaning that a candidate would need 2,246 to win. Clinton says her campaign’s attention to delegate totals is about ensuring that her support from voters translates into the nomination. This is really about how you put the numbers together to secure the nomination. As some of you might recall, in 2008 I got a lot of votes but I didn’t get enough delegates. And so I think it’s understandable that my focus is going to be on delegates as well as votes this time. Priorities USA, which supports Clinton, releases a 30-second ad, subtitled in Spanish, titled This Is the Republican Party, in Colorado, Florida and Nevada. The ad opens with Trump’s announcement speech. The video then cuts to audio of Bush using the term “anchor babies,” and Walker comments on ending birthright citizenship.